I was thirsty, and you gave me something to drink. We are called to care for our neighbors in need due to our faith in Jesus Christ. We also seek to follow the example of our patron saint, Queen Emma. She was a tireless advocate for those in need. St. Mark's supports a variety of projects, some of which are listed below, and any member of St. Mark's may participate in these outreach ministries. For the past two years our Rector and Vestry, in partnership with the Episcopal Diocese of Hawai‘i, have been working diligently to make our campus greener through solar energy. St. Mark's only serves fair trade coffee and tea at our Aloha Hours. The coffee and tea also tastes better knowing that we are drinking cups of justice. The Rector's Pastoral and Outreach Fund is used to help those in need. The fund underwrites the Sunday Supper Ministry, provides assistance to friends in need, and supports worthy community outreach efforts. St. Mark's collects magazines for distribution to the inmates of Oahu's correctional facilities as part of an ongoing literacy project. St. Mark's had a large contingent march in the Pride Parade. Some of our youth serve dinner for the houseless. Every year the preschool has a food drive for the hungry and the homeless. St. Francis is ready for the Blessing of the Animals. Parishioners make healthy snacks for the visiting pets for the St. Francis Animal Blessing. Parishioners serve dinner for the houseless. St. Mark's regularly sponsors pilgrimages to the Holy Land to increase understanding of the plight of Christians in the Holy Land. Father Lillie poses for a photo with one of our guests from the Hawaiian Humane Society. 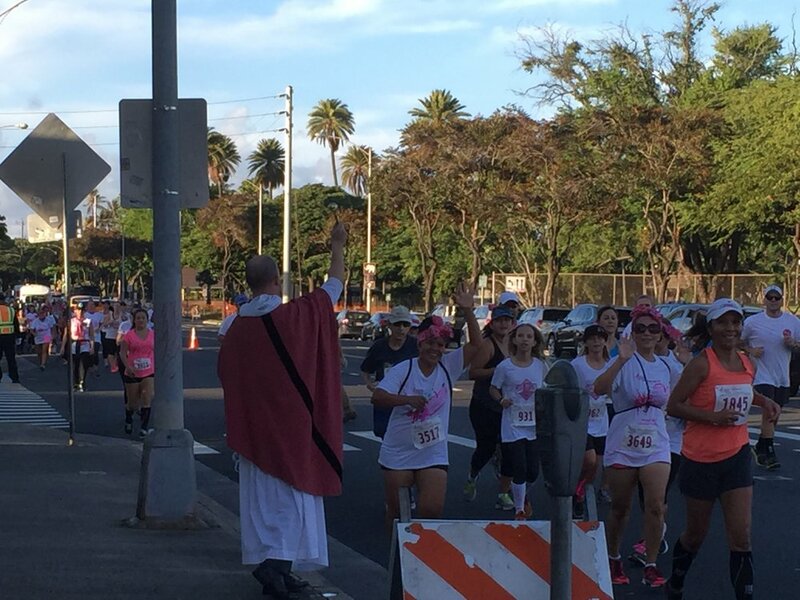 Father Lillie blesses the runners and walkers as they pass by the church during the Race for the Cure. St. Mark's provided desserts for the reception of the Homeless Requiem which was hosted by our sister parish, St. Mary's King Street. Every Sunday St. Mark's cooks and delivers dinners for the homeless of the Kapahulu neighborhood, and every week we collect non-perishable food and hygiene products during our liturgies. We have also partnered with Family Promise and Church of the Crossroads to provide support to the homeless. Every October we have a pet blessing in honor of St. Francis. It is a popular event for our neighborhood, and the Hawaiian Humane Society regularly sends representatives. We donate food and other items to Hale Kipa's program for homeless youth in Waikiki, a growing challenge for our neighborhood. St. Mark's supports the Honolulu AIDS Walk. See our volunteers by clicking here. We also observe World AIDS Day on the first weekend of December. St. Mark's was one of the first churches in Honolulu to reach out to those affected by HIV and AIDS. St. Mark's was one of the first churches of the Episcopal Diocese, as well as Honolulu, to welcome LGBTQ persons. We are proud of our long history of inclusion. Recently our Vestry unanimously affirmed marriage equality legislation for the State of Hawai'i, and the Episcopal Diocese allows St. Mark's and other Episcopal churches to marry and bless loving, committed couples whether gay or straight. We provide financial support to the Episcopal Diocese of Jerusalem and the Middle East, supporting Christians in the holy Land. St. Mark's has also sponsored pilgrimages to the Holy Land in order to facilitate understanding of the challenges of the Middle East conflict, as well as witness the Episcopal Church's peacemaking work. We have regular offerings for the work of our church's official outreach agency. Money has been collected for typhoon relief in the Philippines, tsunami relief in Japan, and earthquake relief in Haiti and New Zealand. The Aloha Ministry of St. Mark's cares for senior citizens and their families in our parish and the greater community. Part of the interfaith initiative of Project Dana, parishioners volunteer to help seniors with various projects such as grocery shopping, transportation to doctor's appointments, or just lending an understanding ear. St. Mark's Kupuna and Friends is a fellowship for seniors, retirees, and their friends. It is a time in which members gather to talk story, have fun, and give each other support. Past gatherings have included outings to the Waikiki Aquarium, the Honolulu Academy of the Arts, the Historic Mission Houses, and the Manoa Heritage Center. Past talks have included lectures on Islam, Medicare fraud, Marian Artwork, Tai Chi, and the Holy Land. All seniors and their friends are welcome to attend. A number of our parishioners are talented knitters, and they have begun to knit prayer shawls for those who are in need of healing for extended periods of time. The shawls are blessed at our masses, and then delivered to those in need by other parishioners. During the holidays we sponsor various outreach projects to families in need so that all may enjoy the Christmas season. St. Mark's collects magazines for local inmates on a regular basis. The magazines help with adult literacy in our local prisons.